It’s that time of year again! 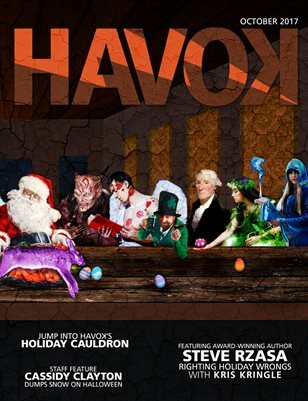 Havok’s favorite season—Halloween! But this year we’re doing things a little differently. 2017 has been The Year of the Mashup. From Literary Mutations to Dinosaurs to Mythical Clashes, our theme this year has involved tearing themes up and mashing them together with other genres to form all-new masterpieces. This last issue of the year, our Holiday Cauldron, does not disappoint, as it spins together all kinds of characters, observances, and festivities, and puts them in a casserole of celebration that can be devoured all year.